When I leave a practice, having provided dentistry training, I make the deal that when they find their first dentigerous cyst or impacted first premolar, I will buy the practice a pizza lunch! Well, Centre Animal Hospital in State College, PA has earned the first lunch! They are now counting teeth and radiographing all areas where teeth are missing, when the medical record does not reflect that the tooth had been extracted. 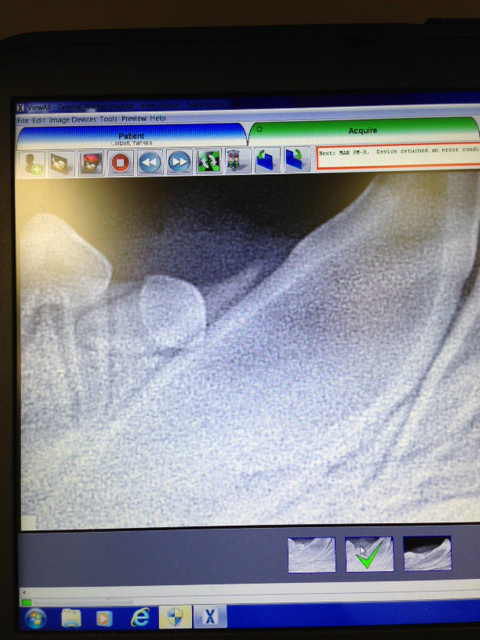 They forwarded me the X-ray and low and behold, the tooth was trapped and positioned horizontally. This tooth was never going to erupt. Their veterinarians extracted the tooth and curetted out any potential cystic lining. This is great medicine and I hope the pizza is as good. I am proud of you guys, Centre! Way to put your CE to work for you, the patient and the client.